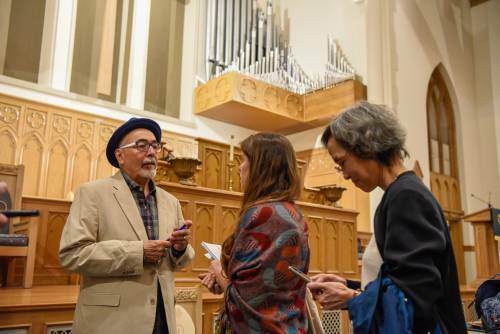 DECATUR, Georgia (PNS) Juan Felipe Herrera stepped up to the microphone Thursday at Decatur Presbyterian Church and started telling stories. There was his father, born in 1882 — “another time,” Herrera said — when he could hop on a train to Denver with little more than a corn cob in his pocket to find work. Herrera recalled his father, Felipe Emilio Herrera, telling him he saw snow for the first time in Denver, and when he spit, it came out ice cubes. There was his mother, María de la Luz Quintana, who came to the United States as a teenager during the Mexican Revolution in 1918 and filled their home with songs, stories, and photographs. They would make toys out of wood that his uncle would paint and sell at a furniture store to make money. Then there was Herrera’s own story of his lunch the first day of school: a flour tortilla and potatoes. Some days, he said, he’d get a tomato sandwich, which turned the bread pink. For years, Herrera felt ashamed of the poverty he grew up in and feeling like an outsider until it dawned on him: “Wait a minute, Juan. It’s not a sad story. It’s not a poor boy’s story. Herrera, 70, was in the church at the center of the Atlanta suburb to deliver the keynote address for the Migration and Border Crossings Conference presented by Columbia Theological Seminary in conjunction with the Emory University Center for the Study of Law and Religion. The three-day conference brings together theologians, scholars, and leaders in the faith community for a multi-faceted look at migration. Read a preview of the Migration and Border Crossings Conference. Before he recounted the poet’s humble roots, Columbia Dean of Faculty Dr. Love Sechrest enumerated some of Herrera’s many achievements, topped by being named U.S. Poet Laureate from 2015 to ’17, the first person of Latino descent to hold that title. The author of dozens of books of poetry and prose for adults and children, Herrera was also California’s Poet Laureate and the recipient of awards such as a Guggenheim Fellowship and the National Book Critics Circle Award for Poetry. All the while, he has championed the stories of migrants in often bilingual works for page and stage. It all goes back to stories, Herrera told the crowd at the keynote, which was filled with asides, impromptu language lessons, a group poetry reading, and some harmonica playing. “Don’t you think those stories, songs and riddles are the beauty of our peoples?” Herrera said. “Don’t you think those stories and experiences and histories of the migrant road are the seeds for a new society? Herrera did tell a story from after he was named U.S. Poet Laureate by then-President Barack Obama. He was a guest on Larry King’s talk show, and though King had been advised Herrera couldn’t discuss politics as part of the rules of his position, the iconic talk show host kept asking Herrera about “illegal immigration.” Herrera finally felt he had to comment. “I said, ‘Larry, people are suffering,’” Herrera recalled. “‘People come 2,000 miles with very little food, with nothing back home but crisis, shootings, incredible pain. And then, if they make it to the wall … they have to face the incredible 120-degree heat of the southern Arizona desert. And if they’re lucky, someone in their family will survive. While Herrera was restricted from discussing politics as Poet Laureate, he is under no such restrictions now. While he did not name President Donald J. Trump, Herrera addressed his signature issue. With those thoughts and more, Herrera got a weekend of thinking about migration off to a rousing start.